Source: Reuters, 21 Aug 2009. SUNJIANANTOU, China, Aug 21 (Reuters) - Every parent in the village of Sunjianantou knows exactly how much lead is in their child’s blood, after 800 children living near a lead smelter in Shaanxi province tested positive for lead poisoning this month. But like millions of other Chinese villagers tight up against smelters, industrial plants and mines, the parents of Sunjianantou have very little idea of the dangers of lead poisoning, how it occurs, or how to avoid it. Nor are they likely to find out. “Please tell us, can the lead ever go away or not?” asked the mother of 8-year old Pengfei, whose test results of 249 micrograms per litre explain how an active small boy slowly turned wan and listless. 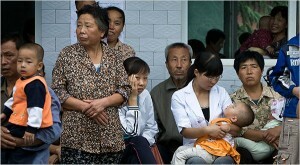 The acceptable level of lead in blood in the United States is 10 micrograms per litre, the China Daily said on Friday. In China, the average level for children under six living in cities is 59.52 micrograms per litre, it added. This month, two cases of lead poisoning of children living near metals smelters came to light in Chinese villages thousands of kilometers apart, showing the prevalence of the problem. Parents from Sunjianantou and other villages attacked the Dongling lead smelter this week, after hundreds of children living near the smelter tested with high lead levels. On Aug 8, parents blocked a road and flipped a police car in Wenping town, southwestern Hunan, in protest against toxins from a manganese smelter. In that town, 1,354 children tested with blood lead levels of over 100 micrograms per litre. Protests against pollution are increasingly common in China, though police normally try and nip them in the bud before they become violent. In other cases, officials show up and mollify residents with promises of financial or other aid. In Sunjianantou, parents who spoke with foreign reporters were visited by local officials and warned not to do so again. At least 10 police cars were stationed outside the idled smelter. A dozen more patrolled the main street. None of the parents interviewed by Reuters on Friday would give their names. “Mass incidents” — or riots and protests — sparked by environmental problems have been rising at a rate of 30 percent per year, according to China’s environmental protection minister, Zhou Shengxian. At the same time, the boom in metals prices has made investment in mines and smelters very profitable, and dangerously polluting plants have sprung up across the Chinese countryside. Local officials, who worry about losing a large taxpayer and employer and may even have a stake in the projects, often turn a blind eye to safety and environmental violations. When protests or a crisis does occur, local governments react by shutting the plant, detaining troublesome villagers and paying the rest, or offering emergency medical treatment. “When a problem bursts out in the media, the government suddenly ’solves’ it,” said Zhang Jingjing, a lawyer with the Centre for Legal Assistance to Pollution Victims. “But that’s usually not a good result, it’s just a way to make the problem go away. She is trying to bring a lead poisoning case to court to set a precedent that could be used against polluting plants across China. In Shaanxi, the mayor of the largest city, Baoji, diffused the situation somewhat by meeting with parents, and answering some questions, the mothers said. But their most important question — whether the smelter will be permanently shut — remains unanswered, a week before classes are due to start at the small grammar school next door. The Dongling Group is one of China’s 500 top companies, according to a banner on its plant, and the 100,000-tonne smelter built two years ago is supposed to meet China’s drive for larger, and supposedly safer, plants to replace the smaller, and even more polluting, predecessors. Children with relatively light poisoning are supposed to be treated at home, but such is the level of distrust of the government that some parents in Sunjianantou are unwilling to give their children the recommended medicine. “We’ve asked for testing but they said no,” said another mother, whose two children both tested at over 200 micrograms per litre.